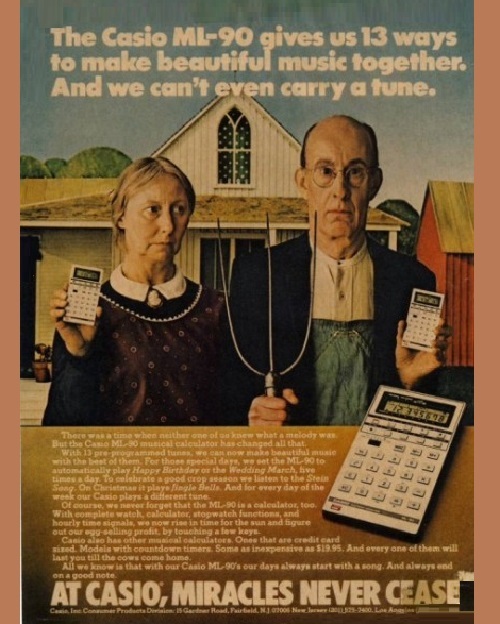 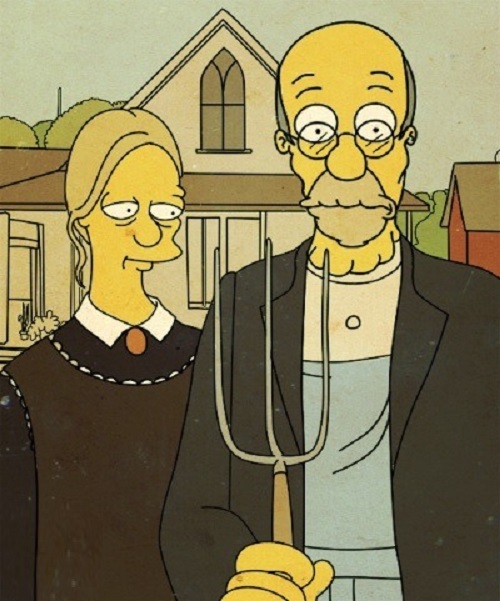 The painting depicts farmers, man and woman on the background of a house built in the style of carpenter Gothic (early Gothic Revival). 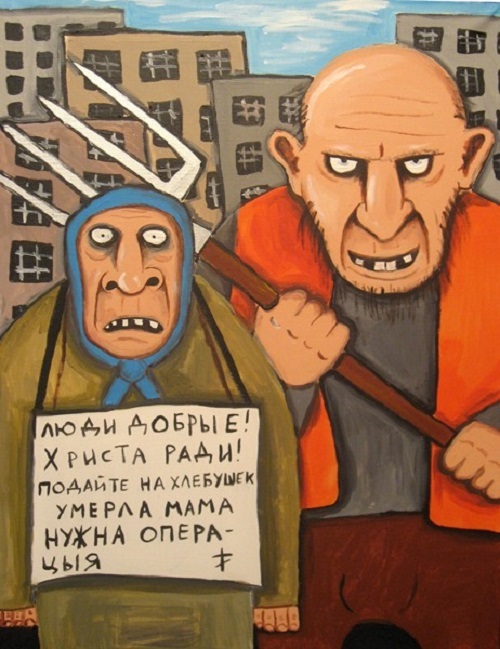 In the hand of the farmer – pitchfork, which he keeps in a clenched fist as a weapon. 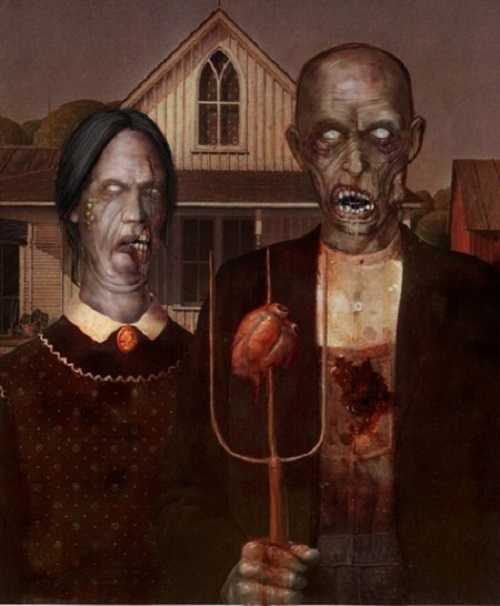 He also tightly compressed lips and has a bad hard look .. seams on clothing repeat contour of patchwork, .. the same circuit can be seen in the windows of houses on the background. 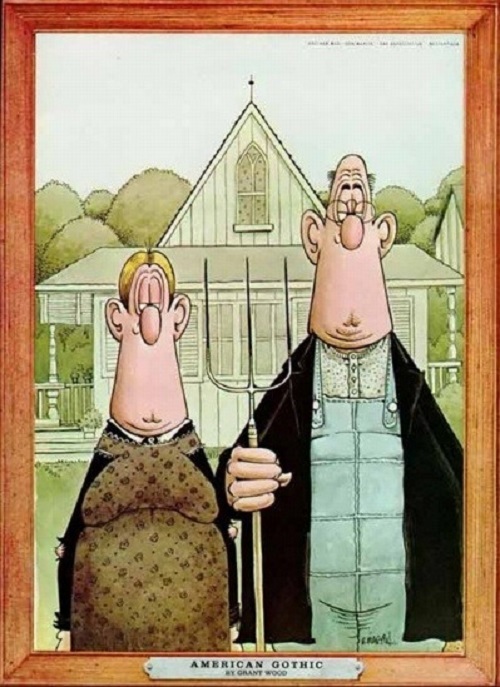 His elbow exhibited before the woman – perhaps his wife, but rather his daughter, whose head is turned towards the father, and gloomy face bore an expression of resentment and indignation. 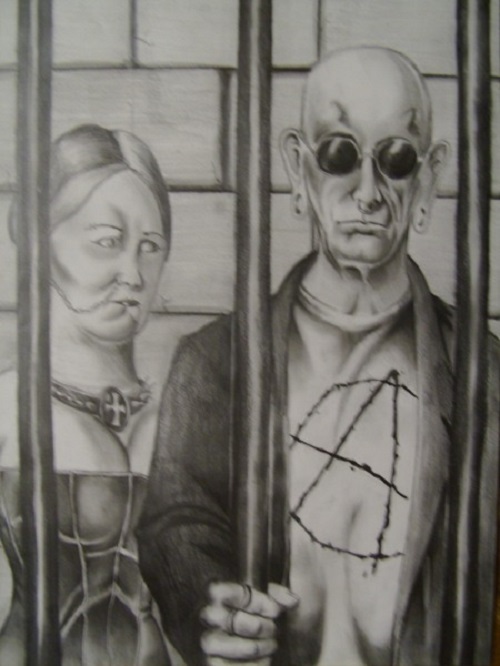 Very unattractive couple, with steadfastness and Puritan restraint which hides threat and dramatic relationship. 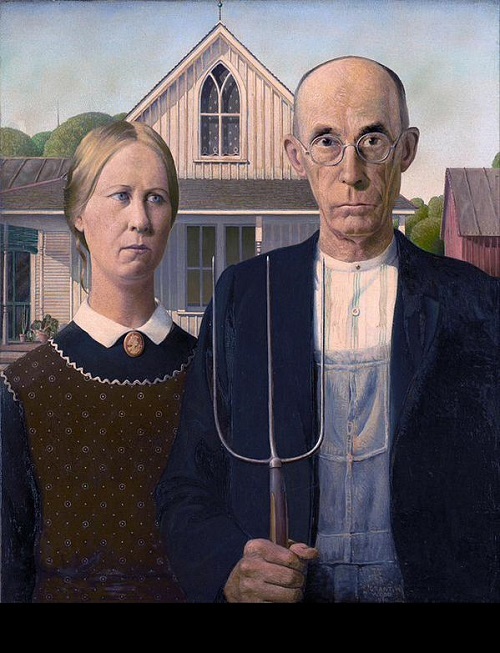 The picture was painted in 1930 in Eldon Iowa – Grant DeVolson Wood once noticed a small white house and wanted to portray it and the people who could live in it. 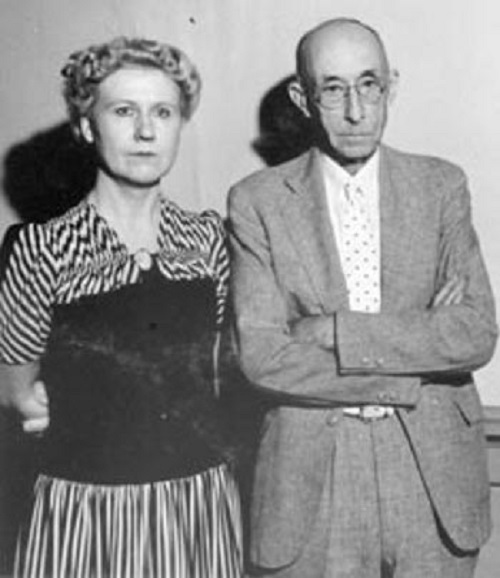 Model for the farmer’s daughter served the artist’s sister Nan and “bad farmer” – Dentist of Wood Byron McKeeby. 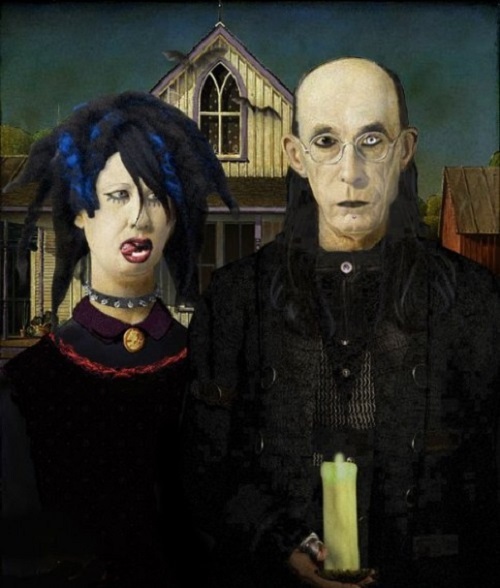 Wood painted house and people individually, separately from the scene, so the painting was never a reality. 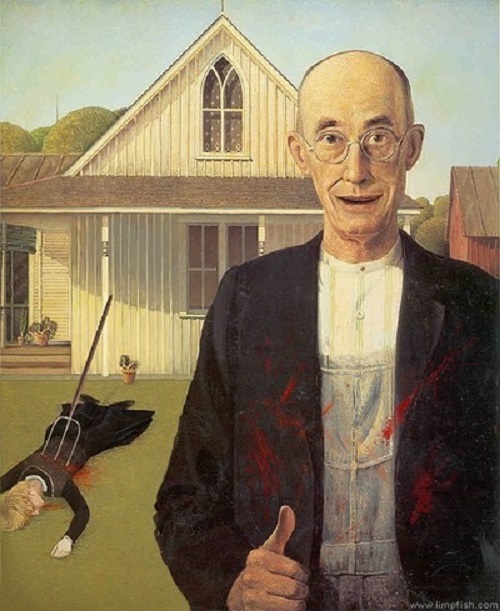 The painting soon became the property of The Art Institute of Chicago (where it is kept to this day), and after the onset of reproduction in the newspaper appeared tough and violent public backlash. 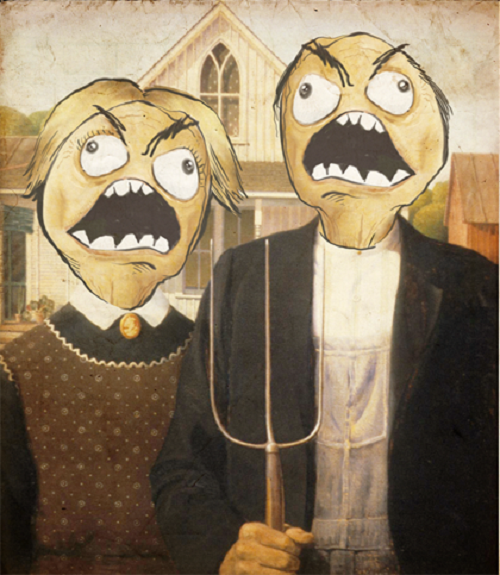 Iowans were angry at the way the artist depicted them. 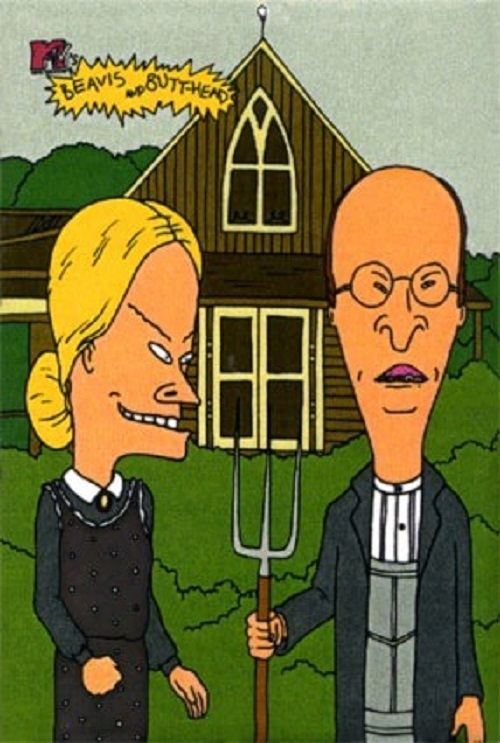 One farmer even threatened to bite Wood’s ear. 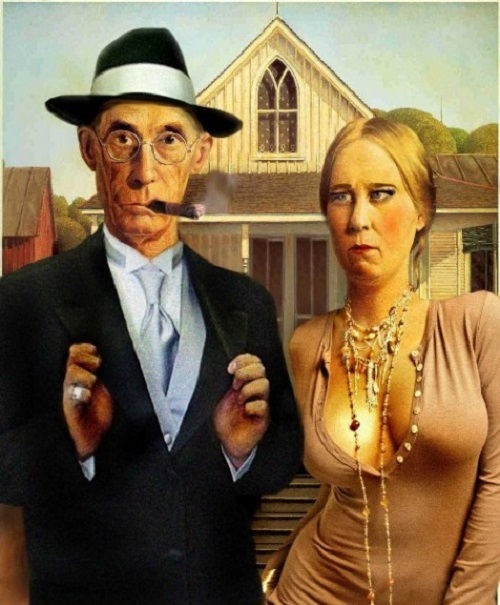 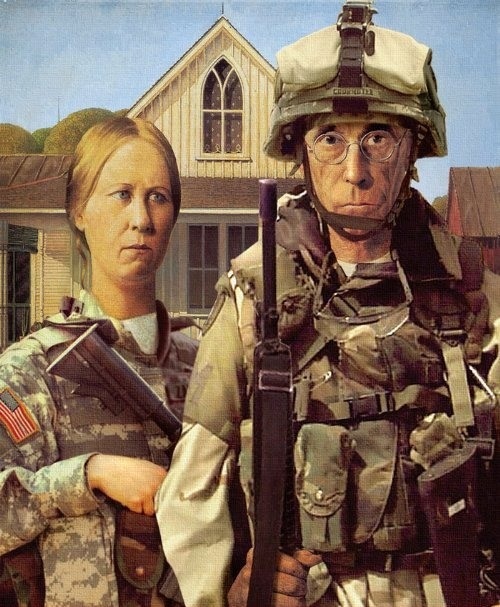 Grant Wood was justified, what he wanted to do was not a caricature of Iowans, but a collective portrait of Americans. 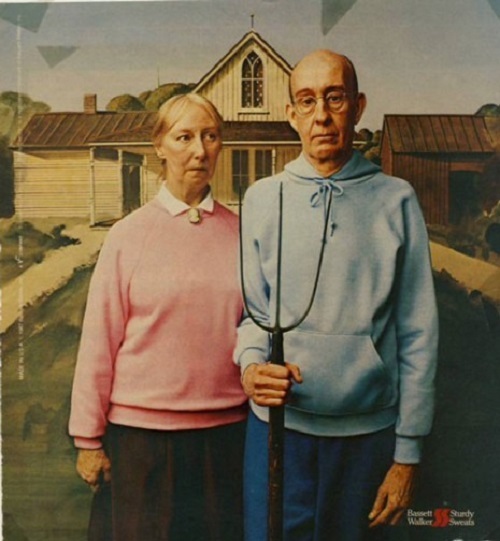 Sister of Wood, offended that she could be taken for a wife of a man twice her age, she began to assert that “American Gothic” depicts a father and daughter, but this moment Wood himself didn’t comment. 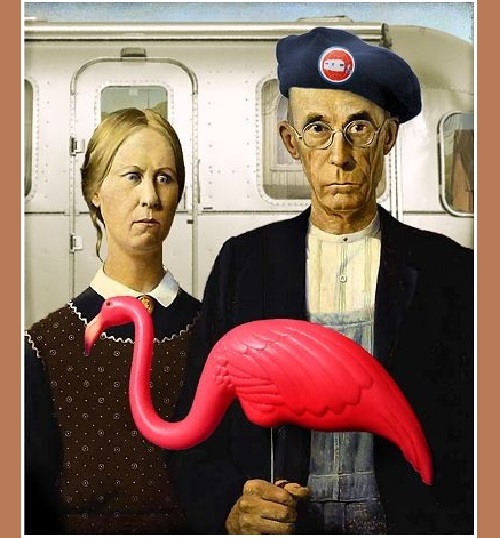 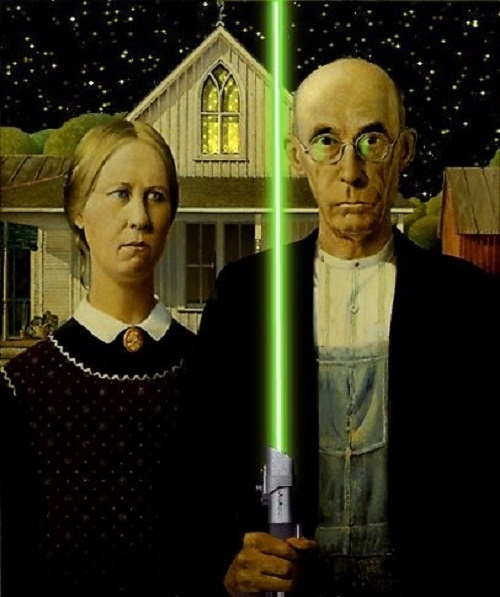 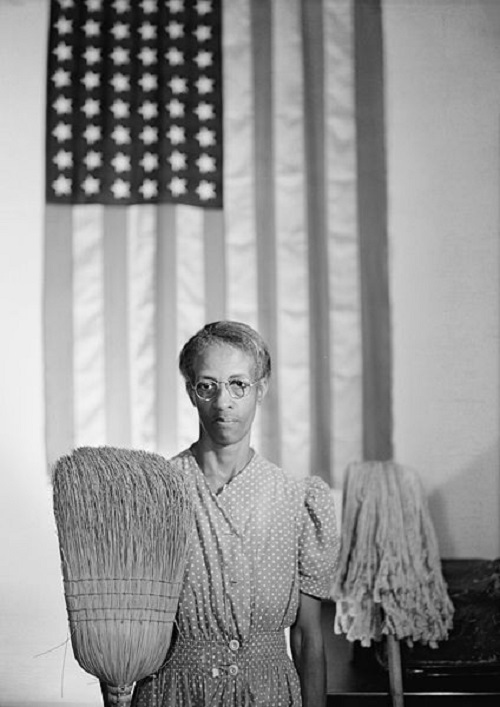 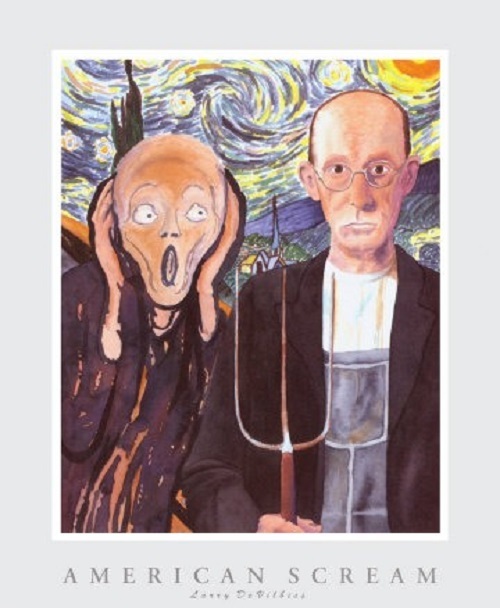 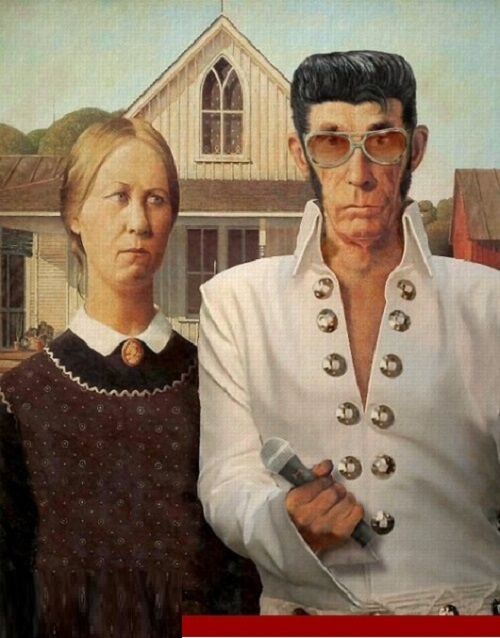 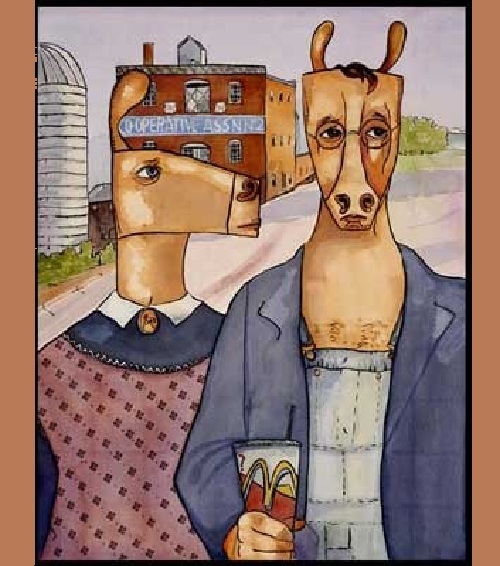 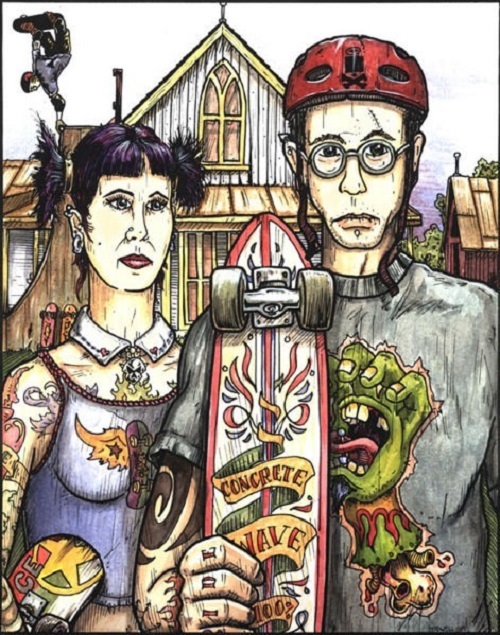 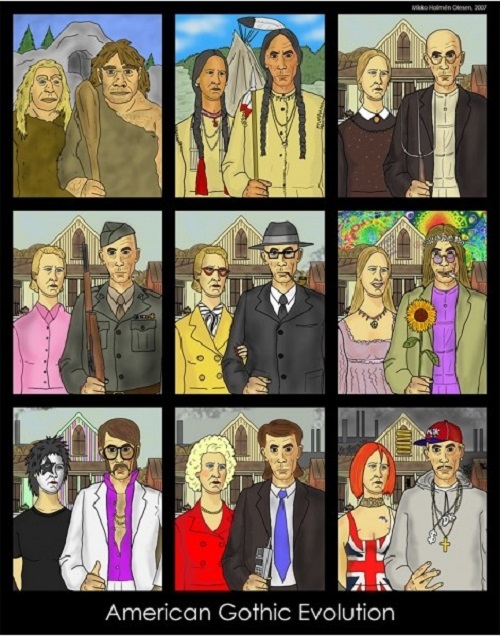 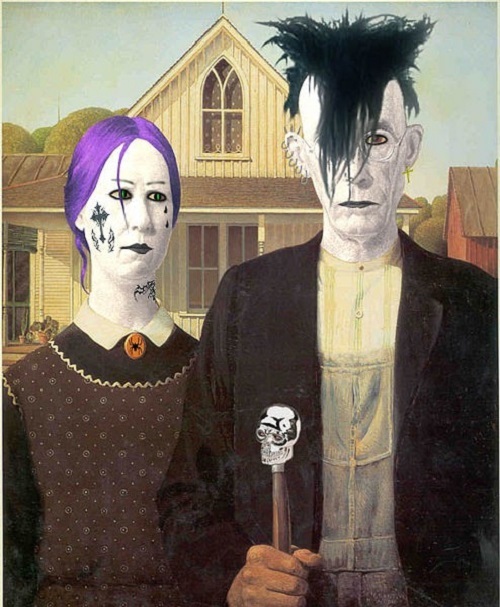 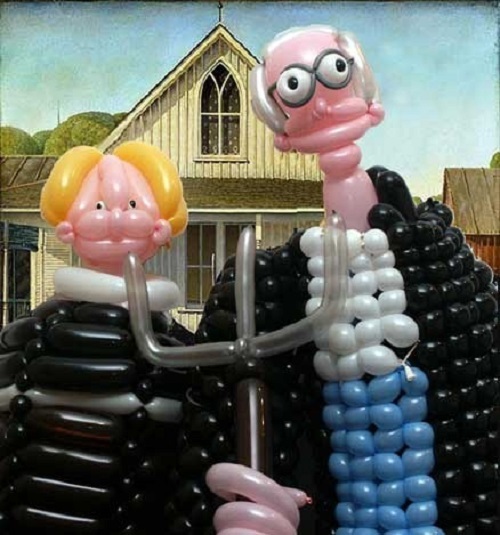 Talented artwork is multifaceted and ambiguous, in the number of copies, parodies and allusions in popular culture with the “American Gothic” few can compare.